Transition costs associated with ramping up a vendor will be encountered in most outsourcing arrangements. However, it is believed that due to circumstances unique to offshoring, the transition costs of these types of arrangements will be more prolific. Specifically, cultural issues will impede the transition of work and knowledge between the client and vendor, requiring additional time. Additionally, there will be communication issues between the client and vendor which will further impede efforts, leading to greater costs. Finally, with offshoring of jobs previously held by domestic employees, there will be a loss of confidence among client employees that will slow the transition of knowledge to the vendor. This study will investigate whether these unanticipated challenges will reduce, and potentially even eliminate, the value of any cost savings sought by the client in entering an offshoring relationship. 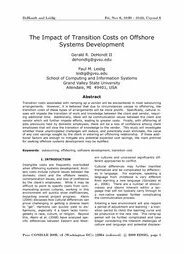 If these additional factors are enough to mitigate any potential expected cost savings, the main premise for seeking offshore systems development may be nullified.